Cape Fear Timber uses up-to-date technologies to organize, manage, and utilize data to enhance our decision making process and track these decisions over time. Cape Fear Timber Company is a full service GIS consulting company, providing a complete range of GIS services to the forest industry and natural resource community. GIS stands for Geographic Information System (GIS). GIS combines layers of spatial and tabular information about the features of a place to give a better understanding of that particular place. 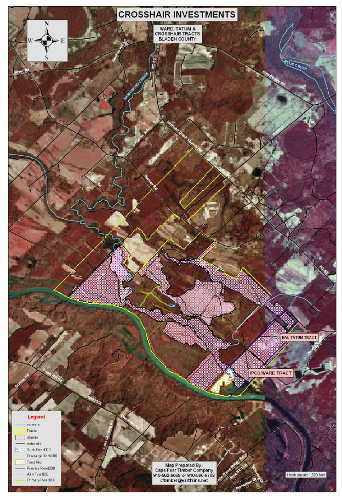 GIS is not just an automated decision making system, but a tool used by Cape Fear Timber Company foresters to query, analyze, and map data in support of the decision making process. GIS stores information about the world as a collection of themed layers that can be used together or individually. The GIS data contains an explicit geographic reference termed “geocoding.” This allows the GIS to know exactly where this data is located in relationship to the rest of the world. The database can be analyzed to find stands or other features that match the desired criteria, enhancing our foresters’ ability to make timely management decisions. 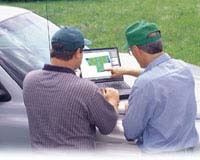 GIS maps are extremely efficient in that they can easily be updated or modified to reflect continuously changing forest management and wildlife management activities such as timber harvests, thinnings, prescribed burning, and wildlife habitat improvement, and food plot location and maintenance. GIS maps can also be exported as digital images that can be attached to emails and viewed in presentations for improved communication to our clients. We also utilize GPS (Global Positioning Systems) to aid in mapping timber types, roads, boundary corners, and in acreage determination. This is shown on a topographic map and aerial photo for detailed mapping of your timberland.